Socialism, Capitalism: Merriam-Webster's Odd-Couple Words Of The Year : The Two-Way The two words, said the dictionary's editor, are essentially antonyms but tell us just how divided the country was during a presidential election that presented a stark decision for the future. 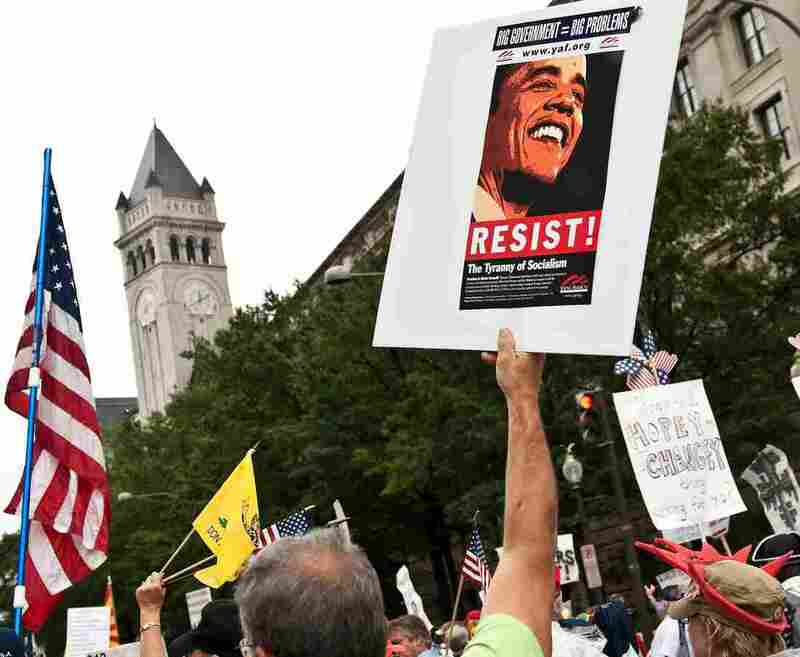 A demonstrator carries a sign calling people to "resist" President Barack Obama perceived socialist policies during a march of supporters of the conservative Tea Party movement in Washington. The dictionary Merriam-Webster has declared an incongruous pair their words of the year: Socialism and capitalism. "There's no surprise there that politics was in people's minds," the dictionary's Editor-at-large Peter Sokolowski told CBS News when making the announcement. Sokolowski said that the dictionary, which bases its decision on what people are looking up in their online edition, chose two words for the first time because they trended together. Most of the time, when a person looked up one word, they looked up the other. Sokolowski says their data — some 100 million page views a month — captures the culture fairly well. He says that as Americans listen to the political debate and the news, they use the "dictionary to begin their research." So 2012's two words — socialism and capitalism — which are essentially antonyms tell us just how divided the country was during a presidential election that presented a stark decision for the future. In his interview with CBS, Sokolowski said the words were looked up when healthcare was in the news and also became very popular as the election season wrapped up. -- Capitalism: "an economic system characterized by private or corporate ownership of capital goods, by investments that are determined by private decision, and by prices, production, and the distribution of goods that are determined mainly by competition in a free market"
-- Socialism: "any of various economic and political theories advocating collective or governmental ownership and administration of the means of production and distribution of goods"
The word of the year in 2011 was pragmatic and in 2010, it was austerity. Sokolowski said that one of the words that saw the biggest spike this year was malarkey, which as you probably remember was used by Vice President Joe Biden during his debate with Rep. Paul Ryan. Schadenfreude — or "enjoyment obtained from the troubles of others" — saw a spike on election day and was a runner up.